1. Go camping: Will this activity ever get old? We don’t think so. Roasting marshmallows, catching fireflies, or even just playing boardgames outdoors is fun for everyone. Check out Cookie Crumbs & Sawdust for packing tips and easy recipes. 2. Garden: This will definitely be an experiment, but gardening reminds children to be kind to the Earth and makes them feel like grownups (which we know they love). They can either help you with your plants or you can keep a potted plant just for the two of you to watch grow (you and the kids can decorate the pot for added fun). Making Boys Men tried it out and provided some realistic tips for gardening with children. 3. Butterflies: Watching a butterfly grow is an amazing thing for a child to witness. This is an exciting teaching moment you can share with your niece or nephew that they will never forget. Texas Butterfly Ranch has some helpful instructions for raising a butterfly at home and Trillium Montessori provides some supplements to the activity. 4. Go on a tree hunt: Kid World Citizen had the great idea to "Make a Neighborhood Tree Guide” with your niece or nephew. Bring out their investigative spirit by helping them find cool trees and tracking which are in the area. This helps them learn about their atmosphere and what lives in it. They can save leaves that have fallen and make a guidebook with what they find. Check out Edventures with Kids for more ideas. 5. Make these amazing nature-inspired crafts: Go on a nature hunt for supplies for an art project. The options range for decorating pebbles to making wind chimes. All of the supplies (besides perhaps paint or string) come from the earth so no waste goes into the projects. Your niece or nephew will leave with a beautiful piece of their artwork to remember the day they spent out with their aunt. 6. Explore the green parks: There's no need for major planning - just visit a beautiful park! In Last Child in the Woods: Saving Our Children from Nature-Deficit Disorder, author Richard Louv firmly argues that being outdoors is as important for children as doing homework or ballet lessons are. Studies show that children who play in nature, especially children who live in urban areas, need time in nature for learning, discovering and enjoying the fresh air as it helps to counterbalance the overscheduled stress many children feel. In fact, studies show that children with ADHD are more likely to do better in green settings than industrial ones. Nature enables them to feel more focused. 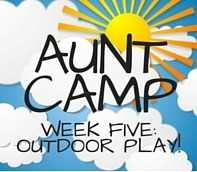 Home Activities AUNT CAMP 5: Nature!